EUR is a residential and business district in Rome, Italy, located south of the city centre. The area was originally chosen in the 1930s as the site for the 1942 world's fair which Benito Mussolini planned to open to celebrate twenty years of Fascism, the letters EUR standing for Esposizione Universale Roma. The project was originally called E42 after the year in which the exhibition was planned to be held. EUR was also designed to direct the expansion of the city towards the south-west and the sea, and to be a new city centre for Rome. The planned exhibition never took place due to World War II. The general commissioner of the agency, Vittorio Cini, presented a list of the most prominent Italian architects available to Mussolini. The list included Adalberto Libera, Enrico Del Debbio, Giuseppe Terragni, Giovanni Michelucci, Eugenio Montuori and Giovanni Muzio. Among the large list, Marcello Piacentini (head of the project), Giuseppe Pagano Pogatschnig, Luigi Piccinato, Luigi Vietti and Ettore Rossi were chosen. The first project, on an area of 4 km2 (1.5 sq mi), was presented in 1938. The name was later changed to EUR, and the final project was presented in 1939. However the Expo never took place due to the Second World War, and the original project was left uncompleted when the works had to stop in 1942. During the World War II the uncompleted EUR development suffered severe damage. However, the Roman authorities decided that EUR could be the basis of an out-of-town business district, which other capitals did not begin planning until decades later (for example, London Docklands and La Défense near Paris). Therefore, during the 1950s and 1960s the unfinished Fascist-era buildings were completed and other new buildings were built in contemporary styles for use as offices and government buildings, set in large gardens and parks. EUR was almost fully completed for the 1960 Olympics, held in Rome. At that time, most of the important infrastructures, such as the Palazzo dello Sport (designed by Nervi and Piacentini) and the Velodromo were completed. The EUR development agency, founded in 1936, became a Società per Azioni on 15 March 2000 and is still responsible for some aspects of management and organization of the area. After a period of controversy over its architectural and urban planning principles, the project to design EUR was commissioned from the leaders of both of the rival factions in Italian architecture: Marcello Piacentini for the "reactionaries" and Giuseppe Pagano for the "progressives". Each of them brought in their own preferred architects to design individual buildings within the district. EUR offers a large-scale image of how urban Italy might have looked if the Fascist regime had not fallen; wide axially planned streets and austere buildings of either stile Littorio, inspired by ancient Roman architecture, or Rationalism, modern architecture but built using traditional limestone, tuff and marble. A panoramic view of the east part of the lake and surrounding district before 2005. The initial project was presented in 1938 under the direction of Marcello Piacentini. 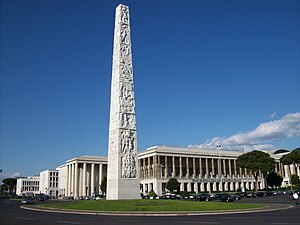 The design was inspired, according to the fascist ideology, by Roman Imperial town planning, with modern elements which came from Italian rationalism, the result being a sort of simplified neoclassicism. The project develops over orthogonal axes and large and stately buildings, built mainly of limestone, tuff and marble, traditional materials associated with Roman Empire architecture. The most representative building at EUR, and the symbol of this architectural style, is the Palazzo della Civiltà Italiana (1938–1943), an iconic project which has since become known as the "Colosseo Quadrato" (Square Colosseum). The building was designed by Giovanni Guerrini, Ernesto Lapadula and Mario Romano, also inspired by Metaphysical art. In 1938 Luigi Moretti (with Fariello, Muratori and Quaroni) won the competition for the design of the Imperial Square (now Piazza Guglielmo Marconi). The large building fronting the square was never finished, but after the war the structures already constructed were used for the "Skyscraper Italy (Grattacielo Italia)" by Luigi Mattioni. Several museums are also present. These comprise the Museo della Civiltà Romana (Roman Culture Museum), the Museo Nazionale dell'Alto Medioevo (National Museum of the Middle Age) and the Museo Nazionale Preistorico Etnografico Luigi Pigorini (Prehistoric Ethnographic Museum). A new planetarium, connected to the Astronomy Museum, opened in 2004. Viale della Civiltà del Lavoro seen from the roof of the Palazzo della Civiltà Italiana. José Martí monument, by Tomás Lara. EUR is the headquarters of many companies and public bodies, such as Confindustria, the Ministry of Health, the Ministry of communications, the Archivio Centrale dello Stato, the Ministry of the Environment, the SIAE, the ICE institute, Eni company, Unicredit, Poste Italiane, INAIL, INPS, and many other multinational companies. It also hosted the NATO Defense College from 1966 until 1999. The "bibliopoint" Istituto superiore "Leon Battista Alberti" is located in the EUR. In 2018, motor racing championship Formula E held a round on the Circuito Cittadino dell'EUR street track, a course which encompasses the ward. The race was won by Briton Sam Bird. The Fascist architecture of EUR was prominently featured in Michelangelo Antonioni's 1962 film L'eclisse and Bernardo Bertolucci's 1970 film The Conformist. Additionally, multiple buildings were shown in Federico Fellini's films Otto e Mezzo, and his scene in Boccaccio '70. The location was also used as the headquarters of Mayflower Industries in the 1991 movie Hudson Hawk and served as a backdrop for scenes from the 1999 film adaptation of Shakespeare's Titus Andronicus. Lara Wendel's death scene in the 1982 movie Tenebrae was also shot in the location. The quarter was featured in the documentary called "A History Art in Three Colours - White" aired by the BBC in 2012 by Art Historian Dr. James Fox. In the programme Dr. Fox focused on the use of white marble in EUR as a symbol of oppression and racism of the fascist regime at the time of its construction, in contrast to the use of white marble of antiquity, Wedgwood tableware and the use of pure white in modern art and art galleries. The burial of Marco Sciarra in 007's Spectre was filmed at Museo della Civiltà Romana. ^ "EUR Spa - La missione". EUR Spa. Retrieved 19 June 2008. ^ a b c "EUR - La nostra storia". EUR Spa. Archived from the original on 3 November 2011. Retrieved 21 October 2011. ^ a b c d e "La storia". www.eur.roma.it. Archived from the original on 5 November 2011. Retrieved 21 October 2011. ^ "Museo della Civiltà Romana - L'edificio". Comune di Roma. Retrieved 21 October 2011. ^ "Museo Nazionale Preistorico Etnografico L. Pigorini". 00100 Roma. Retrieved 21 October 2011. ^ "Planetario di Roma". Comune di Roma. Retrieved 21 October 2011. Wikimedia Commons has media related to EUR. (in German) Luigi Monzo: Review a Beese, Christine: Marcello Piacentini. Moderner Städtebau in Italien, Berlin 2016. In: architectura : Zeitschrift für Geschichte der Baukunst, 45.2015 (published in October 2016), pp. 88–92. (in German) Christine Beese: Marcello Piacentini. Moderner Städtebau in Italien. Berlin 2016, pp. 300–329. Insolera, Italo; Luigi di Majo (1986). L'EUR e Roma dagli anni Trenta al Duemila. Rome: Laterza. ISBN 978-88-420-2797-3. Augias, Corrado (2005). "XV - Il ventennale che non ci fu". I segreti di Roma - Storie, luoghi e personaggi di una capitale. Milan: Arnoldo Mondadori Editore. ISBN 978-88-04-54399-2. This page was last edited on 4 April 2019, at 17:15 (UTC).